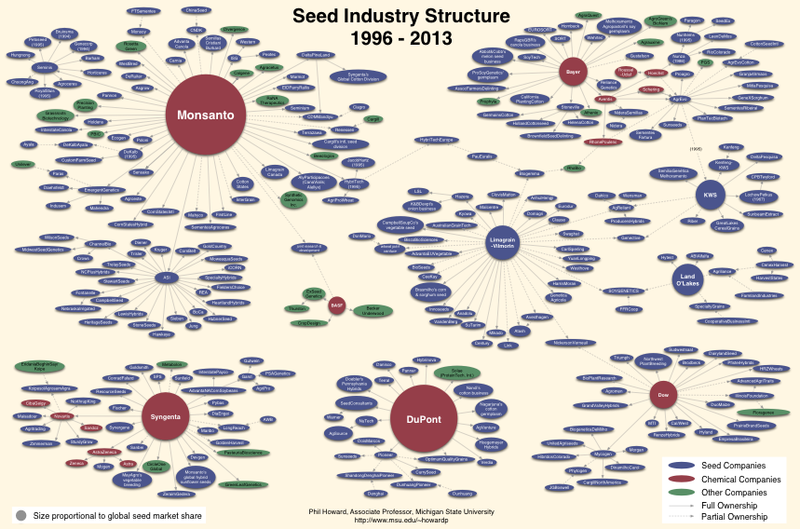 These four firms are now estimated to control over 60% of global proprietary seed sales. A number of the brands acquired in previous acquisitions have been retired. Changes in the last five years also include dozens of acquisitions and joint ventures involving other top global seed firms, such as Limagrain’s Vilmorin-Mikado subsidiary (France), DLF (Denmark) and Longping High-Tech (China). China now has two seed firms ranked in the top ten in global seed sales, ChemChina and Longping High-Tech. Since 2017, Longping High-Tech has acquired Dow’s maize division in Brazil, and controlling stakes in seven seed firms based in China. The firm is reportedly planning additional acquisitions in Argentina. After acquiring the Switzerland-headquartered firm Syngenta, ChemChina is planning more acquisitions in China. The graphic below shows ownership changes occurring from 1996 to 2018. 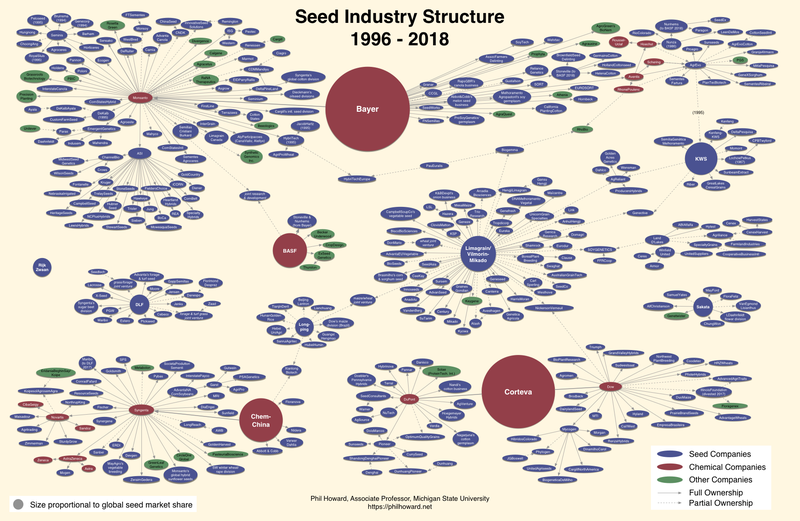 Note that the size of the largest circles are proportional to global seed sales, which are dominated by Bayer and Corteva. Below are earlier versions from (1) 1996 to 2013, and (2) 1996 to 2008 for comparison. There were nearly 400 ownership changes involving these firms in the last 23 years. 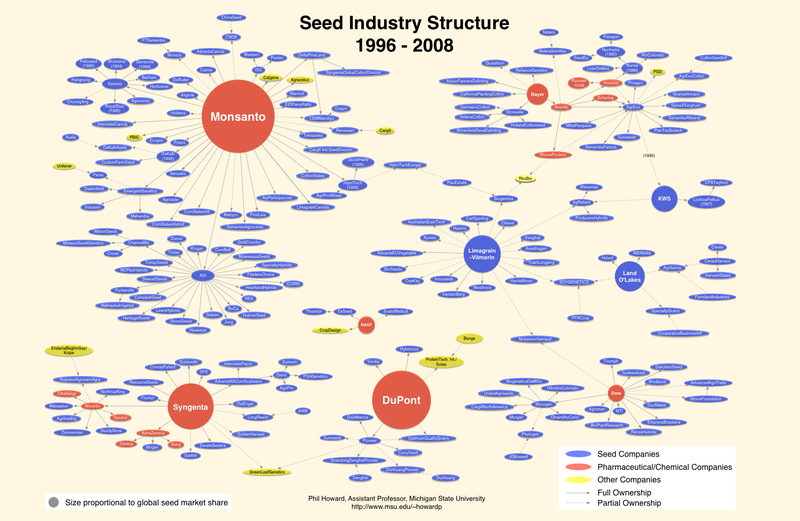 The chart below shows that the peak occurred in 1998, shortly after patented, genetically engineered seeds were commercialized.